Inscription bearing name 'Halutza' discovered amid remains of the ancient city in the Negev. A 1700-year old stone bearing a Greek inscription referring to the name of the city of Elusa (Hebrew: Halutza) has been discovered in archaeological excavations in Halutza National Park in the Negev. The excavations in the ancient city of Elusa are part of a project directed by Prof. Michael Heinzelmann on behalf of the University of Cologne in cooperation with Dr. Tali Erickson-Gini on behalf of the Israel Antiquities Authority. Students from the University of Cologne and the University of Bonn participated in three years of excavations, which are underwritten by the German-Israeli Foundation for Scientific Research and Development. The inscription is being studied by Prof. Leah Di Segni from the Hebrew University of Jerusalem. 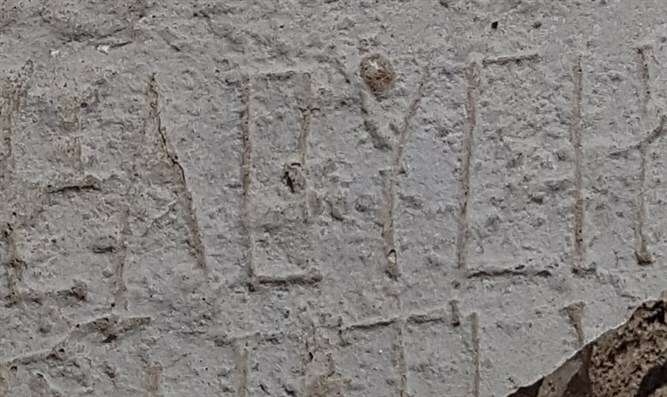 The discovery of an inscription with the name of the ancient city in the site itself is a rare occurrence. The name of the city of Elusa appears in a number of historical documents and contexts, including the Madaba mosaic map, the Nessana papyri and other historical references. However, this is the first time that the name of the city has been discovered in the site itself. The inscription mentions several Caesars of the tetrarchy which allow to date it around 300 CE. In addition, in the recent excavation season, a bathhouse and Byzantine church were uncovered. The 40 m long three-aisled church contained an eastward apse, whose vault was originally decorated with a glass mosaic. Its nave was decorated with marble. The bathhouse is a large, urban complex of which were revealed part of the furnace and caldarium (hot room). The well-preserved hypocaust underlying the caldarium heated the floor and walls by way of brick-built channels and ceramic pipes. Its originates in the Middle Roman period but was in use until the 6th c. CE. Elusa was founded towards the end of the 4th century BCE as an important station along the Incense Road, the ancient road between Petra and Gaza. The city continued to develop, reaching its peak in the Byzantine period in the fourth to mid-sixth centuries CE. In that period, it was inhabited by tens of thousands of inhabitants and was the only city in the Negev. The three-year project, underwritten by the Germany-Israeli Foundation for Scientific Research and Development, included a combination of pedestrian surveys and technological methods such as geophysical surveys and remote imaging in order to map the ancient city and its surroundings. During the project, researchers succeeded in reconstructing the plan of the city and identifying its streets which often were accompanied by porticoes and blocks of buildings, all of which display elements of both western and eastern planning and construction. The surveys have also revealed the presence of nine churches, a huge peristyle building, maybe a market building, and the existence of at least three pottery workshops. The city covered in its heyday a surface of c. 450 dunams reaching a population of c. 8.000 inhabitants.